Ocarina Workshop ceramic ocarinas are handmade in England by our master craftsmen. Each ocarina is well tuned to play with other instruments. The ceramic ocarinas have four holes on top and two thumb holes underneath so that a total of 16 notes, including all sharps and flats, can be played. Ceramic ocarinas feel exquisite to hold, and have a pleasingly mellow sound. 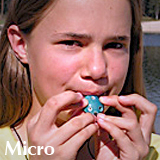 ‘D’ Ocarinas – The ceramic Alto is equivalent in pitch to the plastic Oc®. The ceramic Bass and Mini ocarinas also have D as their lowest note. Choose D Ocarinas with Ocarina Music books and play along with the CDs for your own ‘ocarina-karaoke’. 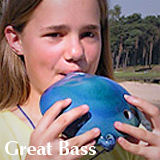 They are also perfect for playing along with descant recorders, flutes, violins and other non-transposing musical instruments, and are ideal for enhancing the sound of your ocarina group. ‘G’ Ocarinas – Micro, Soprano, Tenor and Great Bass ceramic ocarinas complete the solo range. They each have G as their lowest note and play in exactly the same way as D ocarinas, but at a different pitch. Musicians, and those who are good at playing by ear, can play D and G ocarinas together. 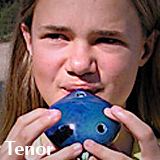 The Duet Ocarina was born out of attempts to play two one-handed ocarinas at the same time. 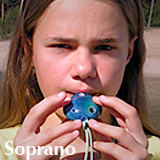 Each Duet Ocarina has two 4-hole chambers in a single outer body to play in unison or two-part harmony. Covering different holes on the left and right chambers simultaneously gives a large number of different combinations to explore sparkling harmonies. Cover the same holes on both to play eleven notes in rich unison. Then play a melody on one side with drone bass on the other to explore a more ethnic ‘bagpipe-style’ sound. The Duet Ocarina Book has music to challenge the skills of any musician. With the help of special Duet finger-charts under the notes, you’ll be delighted to be able to play straight away. Amaze your friends with your solo harmony performances! As with any musical instrument, the size of the ocarina determines its sound. Listen to the sound files to hear the deeply mellow Bass Duet, the high soaring Soprano Duet, the rich Tenor Duet and our favourite of all, the Alto Duet, which is easy to hold and encapsulates all that is best in Duet Ocarinas. 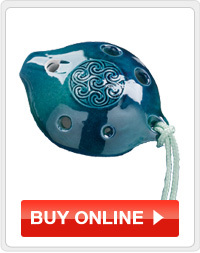 These are unique instruments that open up a whole new world of harmony to the solo ocarina performer. Browse OcShop to choose your favourite.